By AlleyWatch: Whether manufacturing returns to the United States at scale is yet to be determined. However, one thing that is certain is that with the advent of 3D printing and robotics, manufacturing will not be the same. 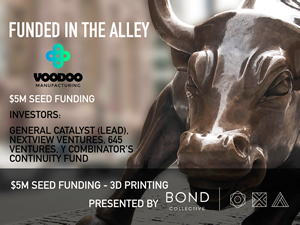 Voodoo Manufacturing is poised to capitalize on this with its software driven 3D printing factory that minimizes costs associated with manufacturing and cuts lead times for mass production. Founded in Brooklyn in 2015 by former MakerBot employees, the startup has raised a total of $6.65M over three rounds and this latest funding is providing the firepower to build the future of automation in manufacturing.